I just KNEW I had to have this popsicle tray for a reason! Not to mention World Market had it on sale! It was only a few bucks and I just couldn't resist. Luckily Pinterest inspired me early on last summer to make my own version of THIS. My version was a bit simpler but just as tasty! Puree your fruit in a blender (after washing it, of course). 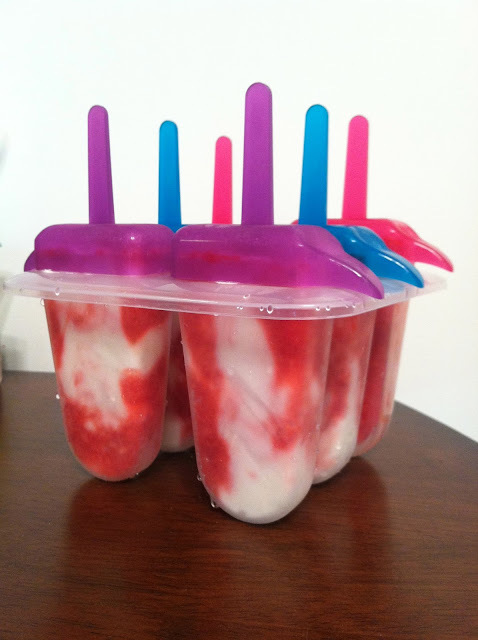 Alternately spoon yogurt and the fruit puree into the popsicle mold. You can also swirl it around with a spoon if you want it more mixed. Got any fun plans this weekend while the weather is nice?